So, in case you don't know .. 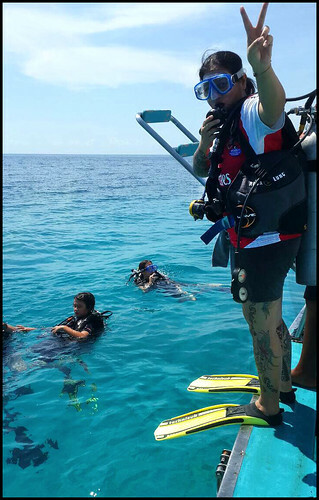 I am manager at Sunrise Divers in Phuket, and have been doing this almost non stop since 2001. It's my job, it pays the bills, pays the kids school, puts food on the table etc. Blogging is just a fun hobby. I came to Phuket in 1999 as a dive instructor looking for work. Found some work. No real plans to stay forever, but then I met my wife who was working in the same dive shop and, well, here we are! You can find a little more on the About Jamie page on this blog! I don't dive much these days, but have logged about 1,500 dives over the years. My wife is a certified diver too and is a very relaxed diver. My daughter has done some little scuba try outs in the pool. 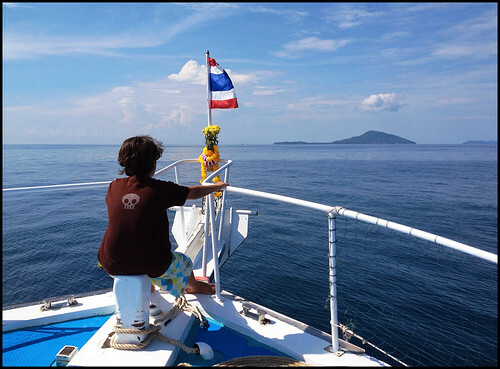 My son just turned 10 this year and officially you should not allow kids under 10 to scuba dive, so we were waiting ... And at the end of April we found a free day, the weather looked good, and the kids were excited to learn that I'd booked us all for a day trip to Racha Yai Island. We have been there before on a weekend trip (staying in a hotel), and I have dived there maybe 100 times, but now the kids are old enough - it's time to dive! (above) On the dive boat and ready to go. 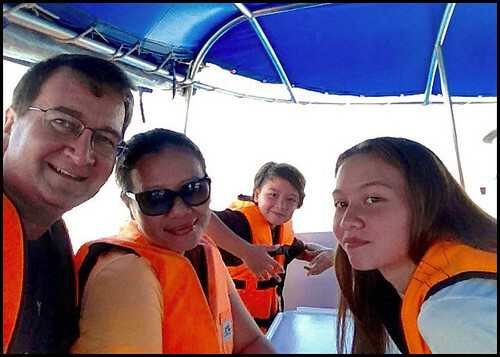 Trips depart from Chalong Bay. We met at Chalong pier about 8am and it was about 8:30am when we set off. 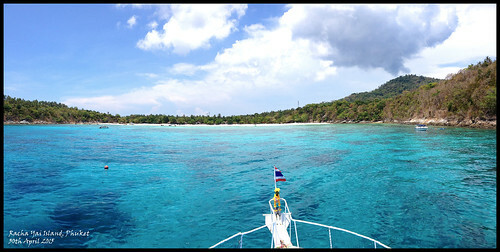 It takes about 90 minutes on a dive boat to reach Racha Yai Island. The dive boats in this area are quite large, have upper deck seating areas and some have a smaller indoor (aircon) saloon area. So it's pretty comfortable, you are not sitting with the dive gear on a bench! Also, breakfast is provided, along with unlimited coffee, tea, and drinking water. I let the family relax while I set up all our scuba gear (OK, my dear wife helped a bit). Only took about 15 minutes to get 4 sets of gear and 4 weight belts ready, then I could join everyone upstairs for a cup of tea. (above) Dive gear, ready to go! (above) Our son takes a seat with a view .. Racha Yai island straight ahead! (above) Racha Yai island, east coast. And we were looking forward to getting in the water! We let others get ready first as we were "non paying customers". 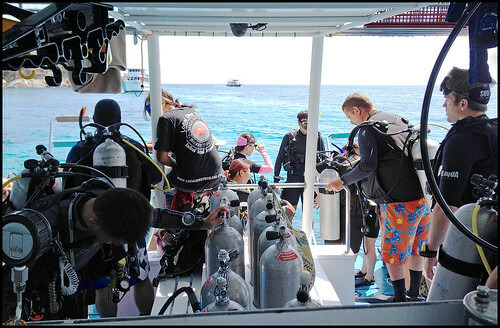 There were about 20 on the boat including 4 or 5 instructors leading different groups of divers from different countries. I figured we'd take our time getting ready as it would be the kids first dive in the sea. It feels a little odd wearing scuba gear for the first time and even stranger once you start breathing through a regulator underwater! (above) My wife ready to dive! After a few teething problems ... both kids would go down a couple of meters and then signal to me that they wanted to go up again .. "my ears feel funny" or "my mask is loose" .. After about 5 minutes we all descended to about 7 meters under water, down to the sand, and the kids looked OK, if a little awkward (you normally do look a bit awkward on a first go at anything! ), so we started to swim around. I did not take them deeper than about 9 meters. My wife has not logged too many dives but is a natural mermaid :) I did not take an underwater camera, as I knew I'd have to keep both eyes on the kids. Instructors should be using their eyes to care for students, not taking photos! But we saw plenty of marine life ..
(above) We saw all of these and more - moray eel, scorpionfish, clownfish, pufferfish, triggerfish, bannerfish, lionfish and more. Always plenty of life at Racha Yai! 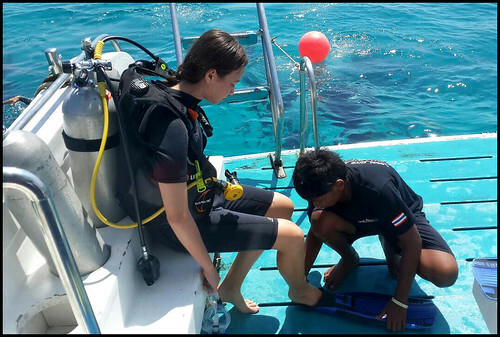 Many thanks to Simon Ilett (a dive instructor working in Phuket) for the photos. Our first dive was about 35 minutes and I was relieved that it had all gone smoothly! 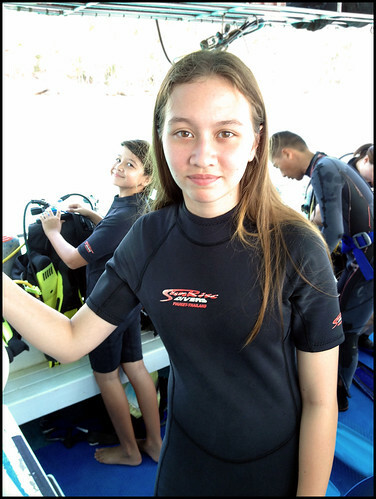 My kids are now divers! These day trips have 2 dives with lunch in between. The boat was moved while we ate lunch, my son had his nose in a fish identification book and both kids were pleased with themselves and ready to dive again. 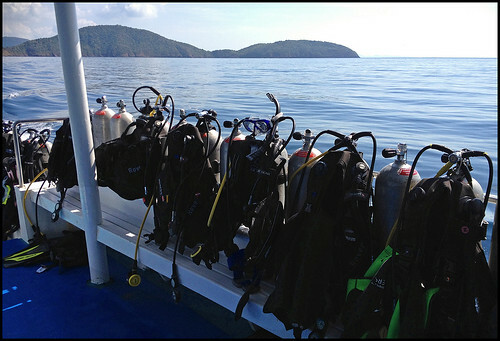 We had our second dive in Siam Bay on the south end of Racha Yai.